Of course, Joel missed a third, crucial type of artist: the angry, spiteful, screaming type who rebel just for the sake of rebellion. 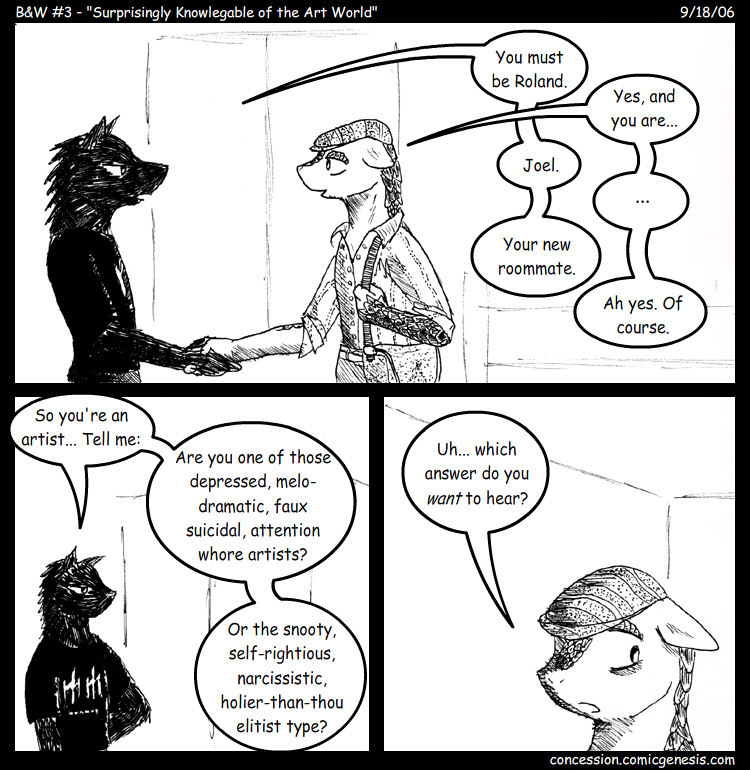 This is not remotely based on any experience with my room mate, nor is Roland based on him. Though they do wear the same type of hat. EDIT: Yeah. I accidentally set it to update Monday instead of Tuesday. I even DATED IT for Monday. Oh well. Also: Roland is a pangolin, not an armadillo. Represent. Double EDIT: Way to not close a hyperlink tag. Stupid. So, this news will mean something to a decent portion of my readers, I suspect: I will be attending FurFright this late October. Will you see me there? If you're going, see if you can find me in the crowd. It'll be hot, trust me.